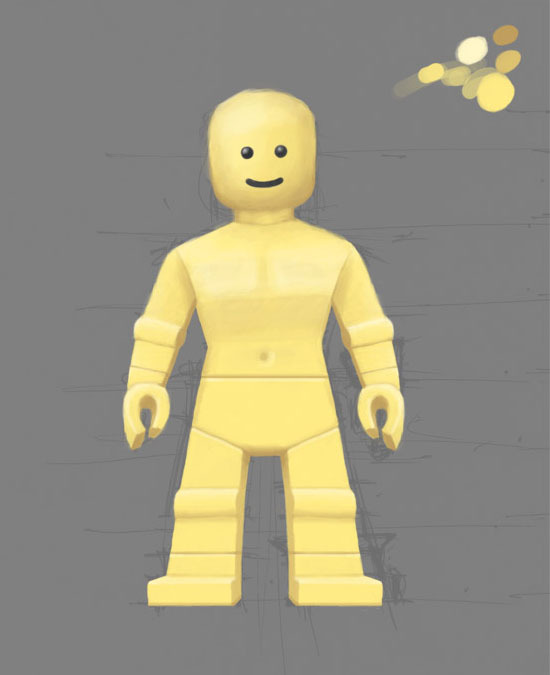 I did a 3D model of a lego minifig a few weeks ago. 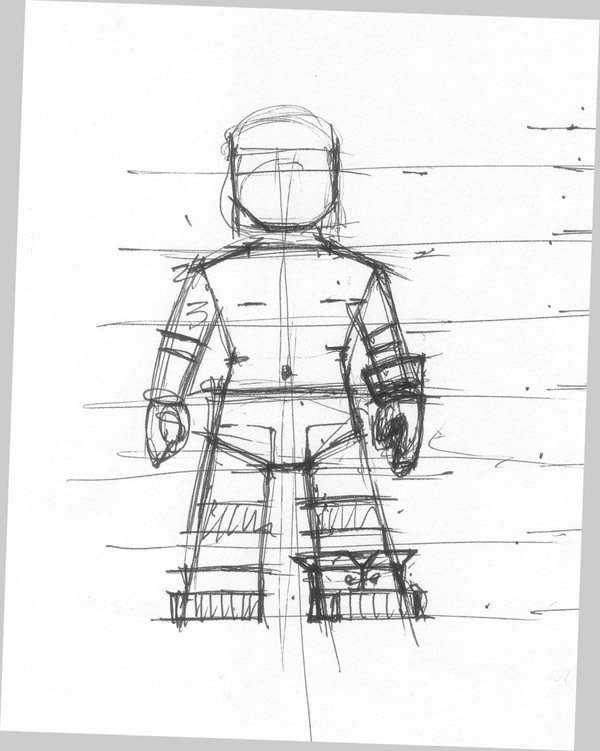 Then thought about how I could have a 3D brik stlye character that didnt violate a pile of patents. hehe nice, it's like the Arnold of Lego. So how did this turn out so far? Or did it go into top secret mode until you made the big decision mentioned in the random musings thread? Two weekends ago I made a preliminary 3D model. I know most projects usually stay secret. So I'm not sure how much I should show, but here it is since I dont even know if it will ever be a project anyway. The green square is 3'-0" although I may make the spaces 4'-0" to give a little breathing room. So a 1x brick could be 8"x8" or 12"x12" havent decided yet. Terrain with some guys on it. I think I may stick with the 3' spaces. Cool stuff so far, are you rigging and animating the piece? Looks like you have an ambiant occlusion pass, do you have to do that seperate from the main render or is it embeded? Any moer progress? My next step is to start rigging and adjusting the model. The shoulders are a bending problem. The game I'm thinking of making will be 2D isometric, so the models will just be posed/rotated 8 directions/rendered to 2D then used. I've nevered rigged anything before so that will take a while, but I havent started yet. I may just do a few poses, standing, pointing gun, dead, just to keep it simple for now. Yes I used ambient occlusion, as a shader. So it renders all at the same time. Each of those images took less than 1 minute to render. No progress since last post. Just working 6-7 days a week on my regular job. Thanks for posting these. I'm not sure if you're interested in crits, but something about the head bothers me. Either it's the length or the stud on top being square, or the whole head being round. Not entirely sure. Also I don't want to poke so much again, but what are the reasons you decided on a lego-like design for your game? Need your parts to be modular to save up on workload and make for easy explosions and such things, or just because you like the look? The head bothers me a bit too and I may alter it a bit. Perhaps pushing in the sides, like a normal head. I did try to push in the lower curve under the ears to define a jaw line like in the sketch. But that just looked worse. I started with no stud on the head but was told by Lego fans that my fig would degenerate to an "action figure", rather than being part of a modular system. So I buckled under peer pressure. It will usually have hair or a hat anyway. 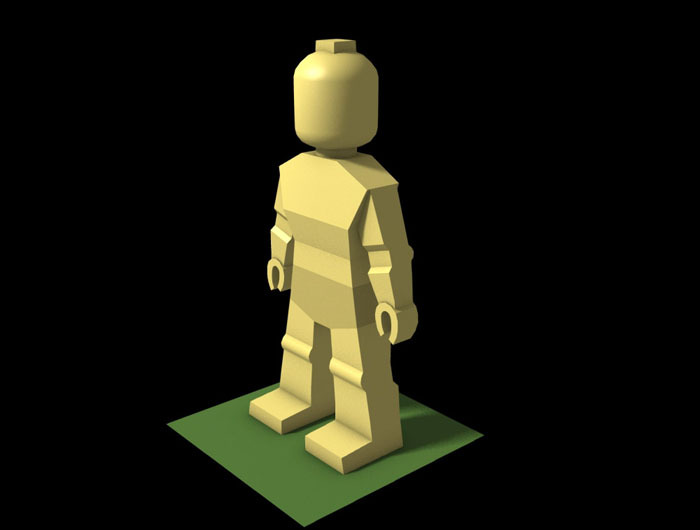 In general a lego shape is similar to a child, large head, short legs. Mine is more like a teen, maybe, I dont want adult proportions. So the head is big. Yeah you got it. 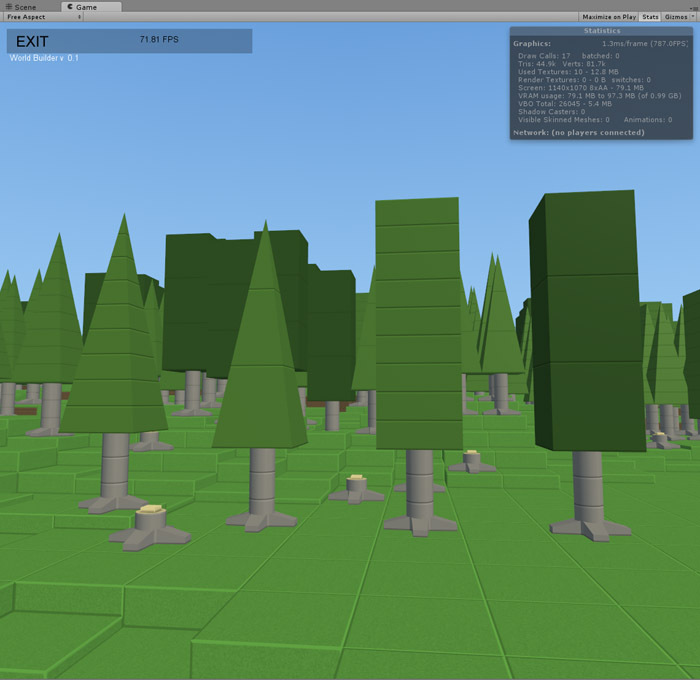 It really saves dev time if I only have a handfull of terrain parts and a single character model. The texturing is simple, just flat color. I do like the look too. I have a pile of game designs but they all require a lot of work. Then I hit a web site in december Brikwars.com. Its a site about a set of rules for playing tabletop battles with Legos. I had made my own set of rules for that back in 1998, so it was cool to see that I wasnt the only one. Then after making the 3D lego guy, while also thinking about what graphic style I would use for a game I was designing, I realized I could use a modular brick system. 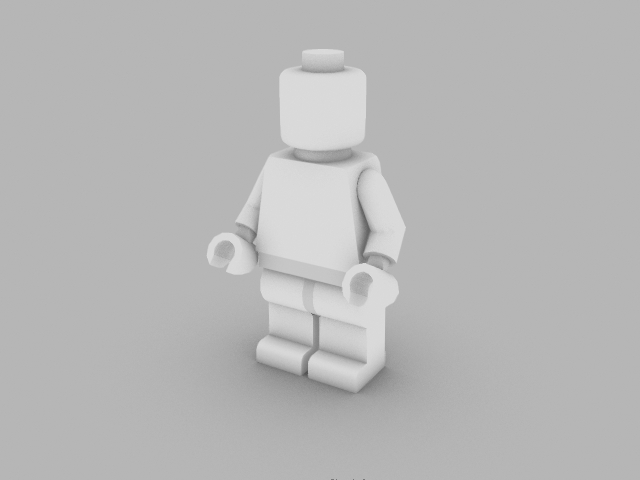 So I created a brick system and minifig free of patent problems. Thats why the studs are square, also squares save polys. Then I realised that I could cut my dev work even further by making something very simple that these Brikwar players might want. 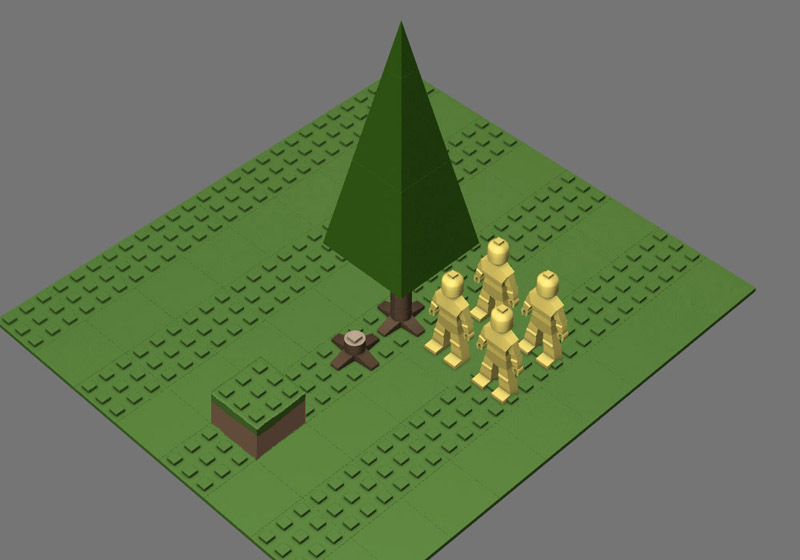 A networked skirmish game where the players can layout their own terrain before battles. Just like they do before a Lego battle. So I dont need a story, single player version, npc/quests. Just a construction editor, simple graphics, rules, networking, turn based. That cuts the work by maybe 60% or more. 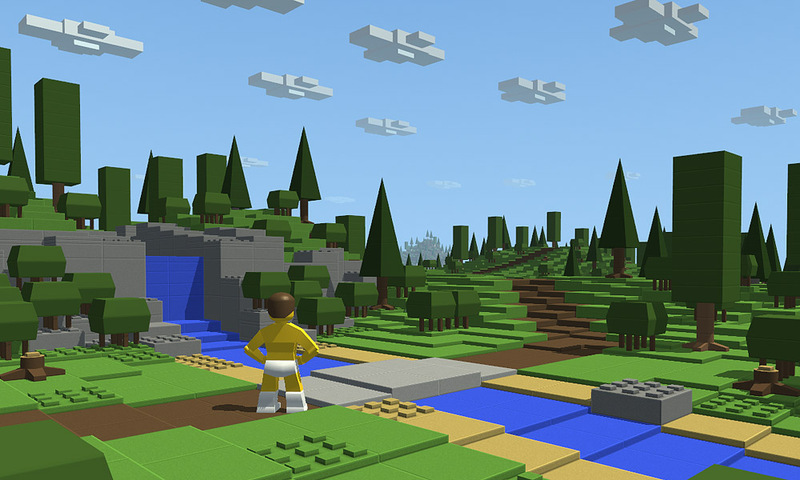 The people on the site play computer games but just cant get together with folks in real life to play a brikwar. So it would actually fill a need. I took a few months off of work this summer and got some programming done, C#. 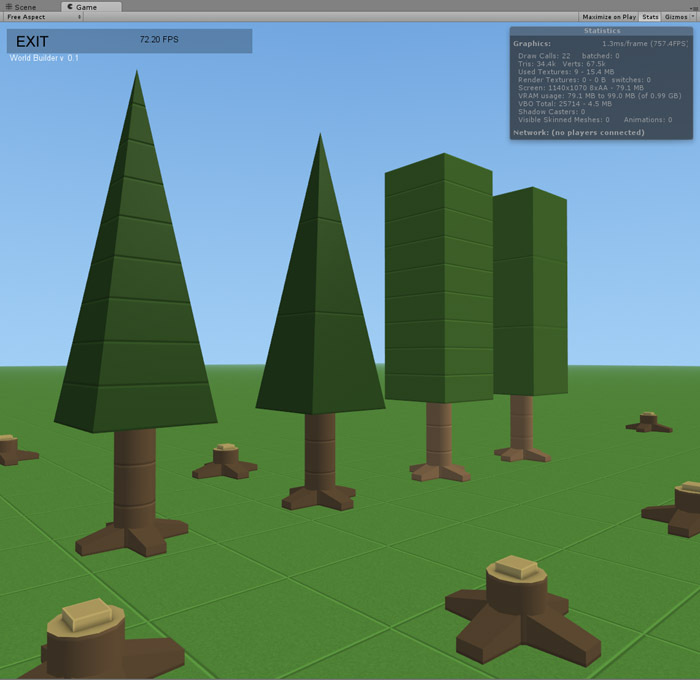 I did this using the windows version of Unity 2.6. 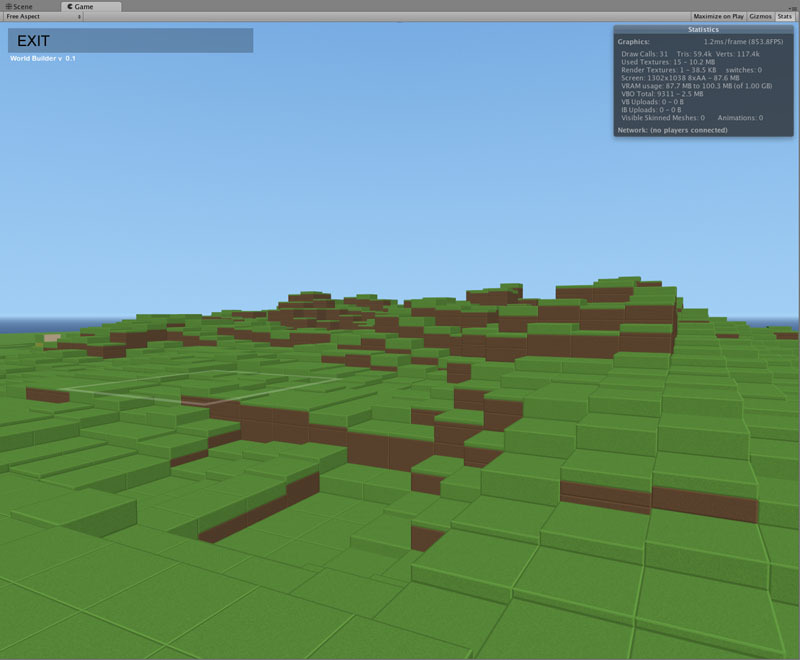 Right now its just a terrain editor. Click on a space and it goes up 1 plate, 3"
Ctrl click it goes down. You can change terrain types. sidewalk, asphalt, grass, dirt and sand so far. 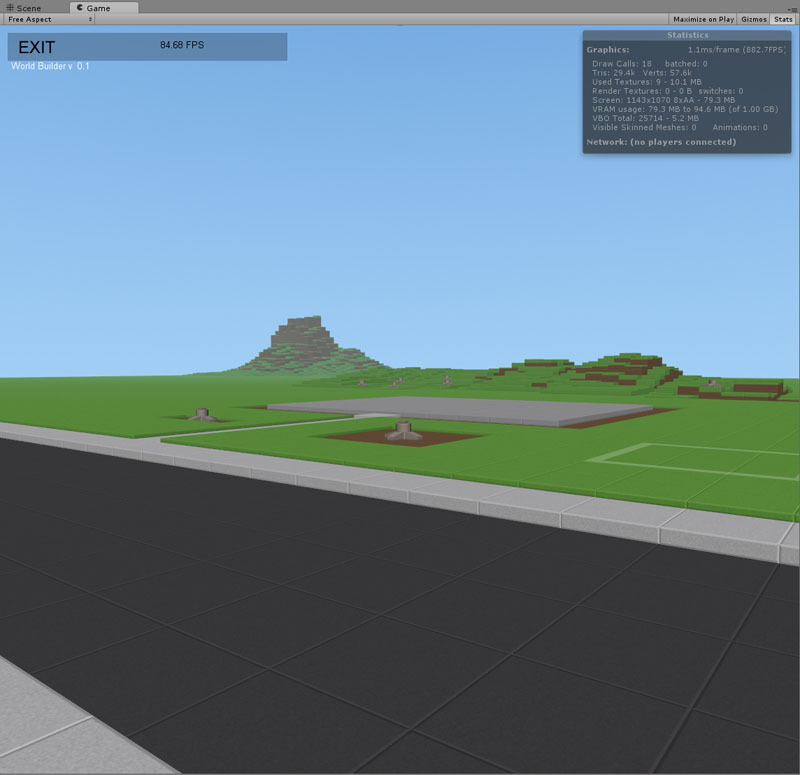 The default terrain is that gray color. It supports 100 colors for bricks, more than enough. I could always add more. All I need now is a free 1+ years to work on just this. But I have to go back to regular work next month. That white rectangle is a 5x5 brush for making changes. Just finished implementing brushes, 5 sizes 1,2,3,4,5. This kind of reminds me of those city scripts for Python, looks cool. You gonna use the terrain for a game? I'm thinking about a turn based strategy game. But I have ideas for about 5 different games that would use this style of art. So yesterday I was messing around with making a webplayer for my game. Its just a few clicks, but I had to comment out System.IO stuff. All the save/load code I was testing. Anyway this will pull up a Unity web player. If you dont have the player, you will be asked to download it. Dont worry, its just like installing Flash. Doing the right click full screen may look weird, blurry. My monitor is 1600, but when I go fullscreen it goes to 1024...??? So I made the player 100% sized, so maximize your browser window. I was going to wait a bit till those were done, but then I didnt. Dont go too crazy with editing, you cant save it. Feel free to take a screen shot of course. If you want to be helpful run http://www.fraps.com/download.php and report your framerate and system specs. Fraps is free, F10 screen shot. 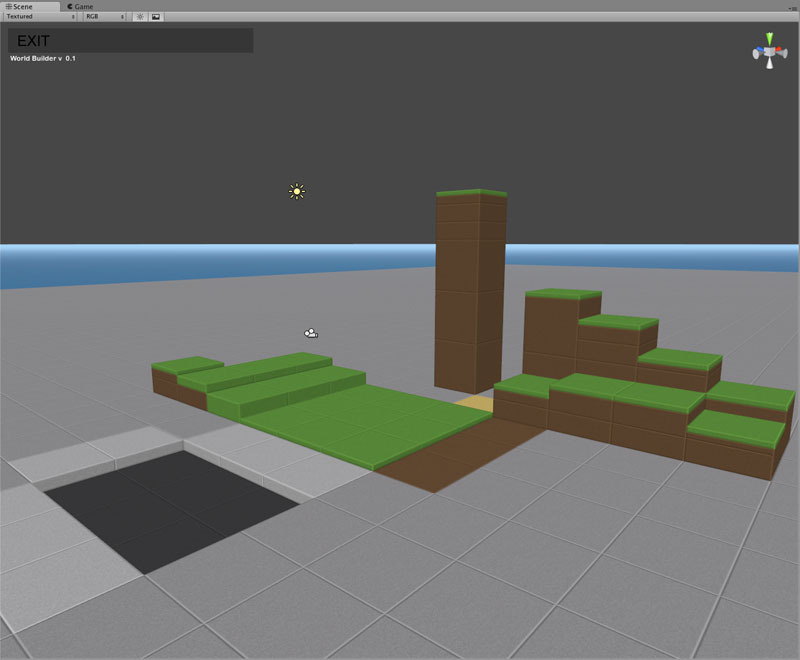 This is just a terrain editor, not a game yet. If the web player seems unresponsive click in the game window. Right click to get menu, to go Fullscreen. ESC key to exit full screen. When a brush size overlaps a baseplate the change only happens on the baseplate that you clicked on. So the spaces in the adjacent plate will not be changed. I added the ability to put landscape elements on the map. Just tree stumps for now. I've been messing around with CSS, just starting really. I took some photos of cardboard, chipboard and a push pin. I rotated 2 pins with CSS code, I didn't know we could do that. I've been reading thru the WC3 school tutorials. I made a few changes to the web page. I added a download link to a Windows PC demo zip file. Dont forget to read the instructions, all the editing commands are on keys, no gui just yet. I made a Mac build and its on the web page. If you try it, let me know if it works. So I've been doing some programming over the last week. Making key presses and the new Unity GUI button clicks map to game actions. Here is a screen shot of the debug console. I do worry what's going to happen when LEGO gets wind of this, but until then it's fun it watch it evolve. Lego has sued just about all its competitors for many different reasons. They sued when other companies used round studs to click thing together, lost. There really isnt anything I'm doing thats an exact copy of what they do. The closest is the head shape. But a Lego head is wider than it is tall. Mine is taller than wide. Of course nothing stops them from doing something mean. I do have a friend that works at Lego HQ in Connecticut USA, so maybe one day I ask him to show this around, maybe not. When can we play this awready? !